Cheshire based beef farmer of Oaklands Red Poll Helen Langley is no stranger to farming, with a family history in dairy, so when after 22 years in London the family moved back to a rural community in Cheshire they took the leap of faith into beef farming starting their own herd of Red Poll beef cattle. With Helen’s 74 year old dad as a mind of experience they have grown their herd to around 40 Red Poll cattle. They suckle their calves for 8/9 months, keep the best heifers for breeding and sell on the steers to a local pub, butchers and the community, making the supply chain and welfare of the animals local and welfare orientated. 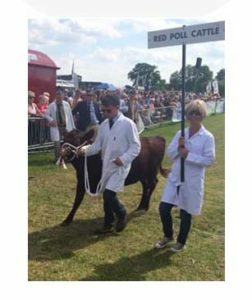 Having won several competitions at their local shows, the herd was named Red Poll Society Small Herd of the Year in 2014, a real accolade for relative newcomers and one that demonstrated their dedication to the craft.